It is kind of ironic because Mimee’s job is teaching swimming but my Mama never took me to her pool before and I have not gone swimming since we were in California with Nana. 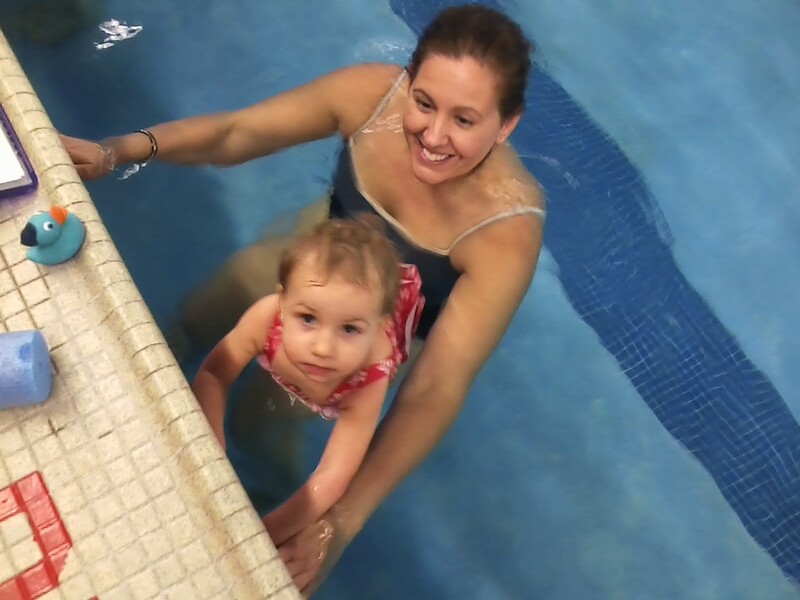 But on Tuesday Auntie and Iris took me to the pool and I got in to swim with Mimee. Rosie rosie, splashes! Kick kick. I watch the babies and try it all out. I can kick kick the water and I can blow bubbles. I hold tight onto Mimee. Some silly toys are floating around, and I grab them. Octopus. Fish. Fun noodle. After the babies leave Mimee and I get to play by ourselves for a few minutes. I climb up the steps and jump into her arms. Again! I jump! Jump! What about the edge of the pool? Mimee puts me up and I have to think about it for a second but I decide it’s definitely worth it. Mimee is all done playing and has to work more. I am so cold my arms are shaking. I run with Iris and we get in a hot hot shower so I can warm up. I wrap my towel on me like a baby to stay warm, then I put on my unders and jammies.